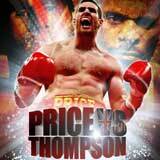 Review: 2013-02-23, David Price vs Tony Thompson gets three stars only thanks to the good finish. The undefeated David Price (15-0-0 with 13 victories coming by way of knockout) entered as the No.14 heavyweight in the world while Tony Thompson (36-3-0) entered as the No.11. Price vs Thompson is the main event of the evening. Watch the video!